Summary. Aim: To compare cancer-specific survival rates for familial and sporadic prostate cancer patients. Materials and Methods: Gleason score and age at diagnosis of familial group and sporadic group were compared by χ2 and t-test. Cancer-specific survival rates were analyzed by the Kaplan — Meier method and compared by log-rank test. Statistically significant level was set at p < 0.05. Results: Among 1175 prostate cancer patients, familial group consisted of 215 (18.3%) patients, the sporadic group consisted of 960 (81.7%) patients. The familial group patient’s mean age at diagnosis (58.9 years old, 95% confidence interval (CI) 57.8–60.1) was significantly younger than that of sporadic group patients (67.2 years old, 95% CI 66.7–67.6) (p < 0.0001). Comparing Gleason score between familial group and sporadic group revealed no statistically significant difference. The analysis showed that 92% (95% CI 0.88–0.97) of familial group patients had a 10-year cancer-specific survival rates, which was a significantly better outcome than that of sporadic group with 69% (95% CI 0.60–0.78) 10-year cancer-specific survival rates (p = 0.0237). Conclusion: The study data demonstrate statistically significant difference between familial group and sporadic group concerning age and cancer-specific survival rates, but not Gleason score. Abbreviations used: CSS — cancer-specific survival; FG — familial group; FPC — familial prostate cancer; HPC — hereditary prostate cancer; PC — prostate cancer; SG — sporadic group; SPC — sporadic prostate cancer; TNBC — triple-negative breast cancer. Prostate cancer (PC) is considered to be one of the most challenging problems in oncology today. The developed Western countries have seen an increase in the PC incidence overtaking now the incidence of lung cancer thus becoming an absolute lea­der, with lung cancer, however, still leading in terms of mortality . Although not all causes triggering PC have been identified yet, age, race and heredity prove to be obvious risk factors. According to research data PC risk doubles in case one of the first degree relatives suffers from it. The said risk will increase by 5–11 times with two or more first degree relatives being PC diagnosed [2, 3]. Up to 9% of all PC cases fall on hereditary PC (HPC), which tends to develop 6–7 years earlier than sporadic PC (SPC) . For other malignancies the heredity factor impacts prognosis. Thus, triple-negative breast cancer (TNBC) BRCA1 mutation carriers tend to respond better to chemotherapy and have better survival rates than sporadic TNBC [4, 5]. Overall survival in case of the Lynch syndrome is better than for sporadic colorectal cancer patients [6, 7]. However, this is not true for all localizations: e.g., patients with hereditary endometrial cancer have lower survival rates than the sporadic endometrial cancer group . The aim of the present study was to compare cancer-specific survival (CSS) rates for familial PC (FPC) and SPC. Study groups. Pauls Stradins University Hospital outpatient clinic provides medical services to about ⅓ of all PC patients in Latvia. As many as 4136 PC patients at all stages of the disease received treatment at the clinic from April 2000 to November 2012. There were 1175 PC patients corresponding to inclusion/exclusion criteria involved in the study. Inclusion criteria were as follows: histologically verified PC; signed informed consent forms. Exclusion criteria: other oncological diseases; lack of family medical history; mental state of patients preventing them from understanding the essence of the research. The follow-up observation period lasted till February 2013. Gleason score was available for 622 patients. The study was approved by the P. Stradins University Hospital Ethics Committee. HPC cases were defined as such according to Johns Hopkins criteria: at least 3 PC cases among first degree relatives, or PC in three consecutive generations of maternal/paternal lineages, or at least 2 blood relatives under 55 developing PC . FPC cases were defined as such when there were 2 PC cases among first degree relatives, or one PC case in one relative under 55. Statistical methods. Gleason score of the familial group (FG) and the sporadic group (SG) were analyzed by χ2-test,and age at diagnosis of FG and SG were compared by t-test. CSS rates were analyzed by the Kaplan — Meier method and compared by log-rank test. Statistically significant level set at p < 0.05. All statistical analysis was performed using R software version 3.0.3. There were 12 definitive HPC cases and 203 FPC ones among 1175 PC patients. Taking into account the small number of definitive HPC patients both groups were combined, thus constituting one FG of 215 (18.3% of all patients). The SG consisted of 960 (81.7%) patients. The FG patient’s mean age at diagnosis (58.9 years old, 95% confidence interval (CI) 57.8–60.1) was significantly lower than that of SG patient’s (67.2 years old, 95% CI 66.7–67.6) (p < 0.0001). 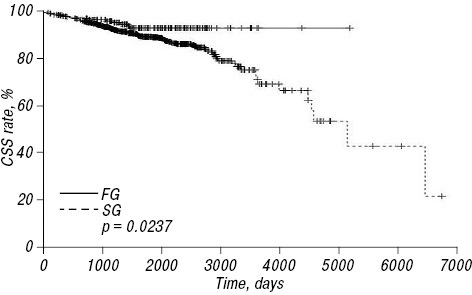 Comparing Gleason score between FG and SG revealed no statistically significant diffe­rence (Table). The analysis showed that 92% (95% CI 0.88–0.97) of FG patients had a 10-year CSS, which was a significantly better outcome than that of SG with 69% (95% CI 0.60–0.78) 10-year CSS (p = 0.0237) (Figure). Out of the total of 1175 patients participating in the study 12 (1.02%) were diagnozed with definitive HPC. Some other research data indicate that HPC ratio among all PC cases reaches 9–10% . This ratio difference may be explained by the fact that Latvian families are relatively small with the total fertility rate in the country being 1.22–1.59 over the 2000–2012 period. Due to the small size of Latvian families it is often difficult to make well-grounded conclusions ­concerning hereditary diseases on the basis of the available data on family medical history . No statistically significant difference of Gleason score between FG and SG patients was found, which shows that the diffe­rence in CSS between both groups is not associated with the cancer grade. The 10-year PC CSS in Latvia over 1990–2001 period grew from 32.9% (29.2–36.6) to 40.5% (37.2–43.8) . According to our results, the 10-year CSS for SG increased to 69%. As far as the 10-year CSS for the FG is concerned, it is by 23% higher than in the case of SG. Such high CSS rates are shown in a Swedish study on PC natural history . In conclusion, the study data demonstrate statis­tically significant difference between FG and SG ­regarding age and CSS, but no such difference is observed in case of Gleason score. 1. Center M, Jemal A, Joannie Lortet-Tieulent J, et al. International variation in prostate cancer incidence and mortality rates. Eur Urol 2012; 61: 1079–92. 2. Jansson KF, Akre O, Garmo H, et al. Concordance of tumor differentiation among brothers with prostate cancer. Eur Urol 2012; 62: 656–61. 3. Hemminki K. Familial risk and familial survival in prostate cancer. World J Urol 2012; 30: 143–8. 4. Maksimenko J, Irmejs A, Nakazawa-Miklasevica M, et al. Prognostic role of BRCA1 mutation in patients with triple-negative breast cancer. Oncol Lett 2014; 7: 278–84. 5. Cortesi L, Masini C, Cirilli C, et al. Favourable ten-year overall survival in a Caucasian population with high pro­bability of hereditary breast cancer. BMC Cancer 2010; 10: 90. doi: 10.1186/1471-2407-10-90. 6. Haghighi MM, Vahedi M, Mohebbi SR, et al. Comparison of survival between patients with hereditary non polyposis colorectal cancer (HNPCC) and sporadic colorectal cancer. Asian Pac J Cancer Prev 2009; 10: 209–12. 7. Stigliano V, Assisi D, Cosimelli M, et al. Survival of hereditary non-polyposis colorectal cancer patients compared with sporadic colorectal cancer patients. J Exp Clin Cancer Res 2008; 27: 39. doi: 10.1186/1756-9966-27-39. 8. Svampane L, Strumfa I, Berzina D, et al. Epidemiological analysis of hereditary endometrial cancer in a large study population. Arch Gynecol Obstet 2014; 289: 1093–9. doi: 10.1007/s00404-013-3074-7. 9. Carter BS, Bova GS, Beaty TH, et al. Hereditary prostate cancer: epidemiologic and clinical features. J Urol 1993; 150: 797–802. 10. Vanags A, Strumfa I, Gardovskis A, et al. Population screening for hereditary and familial cancer syndromes in Valka district of Latvia. Hered Cancer Clin Pract 2010; 8: 8. doi: 10.1186/1897-4287-8-8. 11. Plonis J, Bokums K, Cauce V, et al. Prostate cancer trends in Latvia during 1990–2012: incidence, prevalence, mortality, and survival rates. Medicina 2014; 50: 313–7. doi: 10.1016/j.medici.2014.11.002. 12. Popiolek M, Rider JR, Andren O, et al. Natural history of early, localized prostate cancer: a final report from three decades of follow-up. Eur Urol 2013; 63: 428–35. doi: 10.1016/j.eururo.2012.10.002.